Should You Choose Pure Water Window Cleaning? Pure water window cleaning uses ultra-purified water in conjunction with specially designed brushes, and usually carbon fiber extension poles (this procedure is also often referred to as “Water Fed Pole”, or WFP cleaning) to clean windows where in times past extension ladders or lifts, window mops, squeegees, towels or chamois would be required. 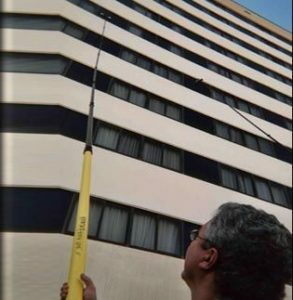 Water Fed Pole cleaning has been around for decades, we were using this process in the early 1980s at Great Lakes Window Cleaning. However its effective use was limited until the cost of purifying the water became more affordable; and ultra-purified water was incorporated into the process. There are advantages on site; fewer ladder climes are required and landscaping is not put at risk as with lifts, it also takes less hand-eye training and “muscle memory” for a technician to become effective. This is off set however, by the technician fatigue using the longer extension poles and the costs of filtering the water and maintaining / replacing the filtering & pumping equipment; in addition; those specialized poles can cost several thousand dollars each! In situations where it works; it works better! than traditional window cleaning; NOTHING is left on your windows and frames; they are cleaner than when cleaned with traditional squeegee methods. Frankly the process does not get perfect results in every situation and there is a consideration of the client’s expectations and their cost/benefit assessment; where window cleaning has been neglected for over a year or so, have any oily type soils on them, where there is silicone, caulk or other construction related materials on the glass, can all be made “cleaner” with this process; but these situations require a window cleaning technician to be “hands on” with the glass to get best results. Years of traditional window cleaning may also have left a detergent/soap residue on the edges of the glass, sills and frames that can bleed or run into the glass and it may take several Pure Water Cleanings to completely remove and spots, drips or “runs” may be visible after cleaning until then. Poorly glazed or sealed window units can also hold and leak impure water back onto the glass, leaving occasional “runs”. DI water aggressively attracts and holds minerals & soils loosened from glass the surface at the molecular level. Pole mounted brushes are specially designed to loosen soils from glass. Windows are scrubbed and then rinsed with the purified water. Di water will leave no spots on its own; much like a car wash spotless rinse. Your windows, frames and mullions are left cleaner. No soil attracting soap residue is introduced. No Chemicals are used, environmentally friendly. No residues to attract soil or to spot when it rains. Usually quicker, safer and less disruptive than ladders/lifts and squeeges. 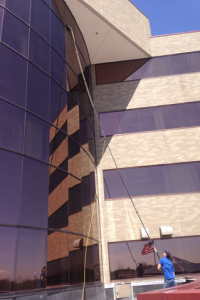 Often no more expensive than traditional window cleaning. Does not remove silicone, caulk or other construction related debris. Can take a few cleanings to remove built up soap residues from previous traditional cleanings. Is not restorative cleaning; best used on properly maintained glass. Process is not as simple as it looks; Significant technique and training is required for technicians to get consistently good results. Even in some situations where the Pure Water Process does not get perfect results and there is the occasional soap residue spot, or run on the glass after washing. The efficiencies when compared with traditional lift/ladder & squeegee process may more than satisfy the client’s expectations and their cost/benefit assessment. Feel free to contact Great Lakes Window Cleaning for a no -obligation evaluation of how we can resolve your window cleaning and budgetary needs. © Great Lakes Window Cleaning, Inc. and GreatLakesWindowCleaning.com, 2014, 2018. Unauthorized use and/or duplication of this material without express and written permission from this site’s author and/or owner is strictly prohibited. Excerpts and links may be used, provided that full and clear credit is given to Steven L. Miller and Great Lakes Window Cleaning, Inc. with appropriate and specific direction to the original content. 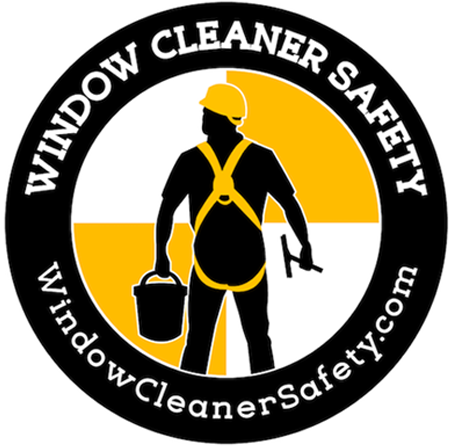 ← When is a Low Window Cleaning Price too Low?